Craig Henderson started Extract Labs, a Boulder, Colorado-based company offering cannabidiol-infused products, in the garage of his home in December 2016. Now, less than two years later, the multimillion dollar company of 25 staff has become a staple in the increasingly popular realm of cannabidiol, or CBD, the main medicinal ingredient in marijuana. Henderson, an Army infantry veteran who saw combat in Iraq in 2004 and 2005 while part of 1st Battalion, 27th Infantry Regiment, began taking an interest in CBD, a non-psychoactive chemical, as he was finishing up his engineering master’s at the University of Louisville. Henderson was eventually contacted by Apecks Supercritical, an extraction company based out of Ohio, where he was offered a job. Not long after, he got his wish to relocate to Colorado, where he opened a new location for Apecks. Business took off from there. That decision by the combat vet-turned-marijuana processor has paid off, so much so that Extract Labs recently opened a second lab in Louisville, Kentucky. The company also recently rolled out a new line of CBD-infused pet products, which, much like those consumed by human users, have done wonders for animals suffering from epilepsy. “Pet owners swear by [CBD],” Henderson said. 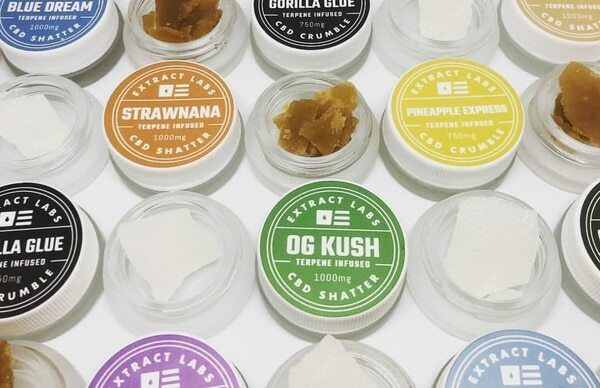 In the extraction process, the psychoactive component of marijuana, THC, is either eliminated entirely or reduced to 0.3 percent or less, making products like those provided by Extract Labs legal in all 50 states. A quick visit to the company website yields a variety of available goods — tinctures, body and muscle creams, crumbles, shatters, isolates and even vape juice (as a healthier alternative to nicotine) — for customers looking to remedy any of the aforementioned afflictions. The growing list of medicinal benefits has caught the eye of top health organizations, some of which are traditionally slower to approve select methods of health care. On June 25, the U.S. Food and Drug Administration approved CBD as a treatment for two forms of epilepsy.